SMITHFIELD — Business After Hours began as a small, informal networking event for members of the Smithfield-Selma Chamber of Commerce. It’s now one of the chief benefits of chamber membership, business owners say. Every month, chamber members gather at a local business for food and the chance to network. Last month, the location was Anna Kate’s Gifts and Monogramming on South Bright Leaf Boulevard, where members alternated between exchanging business cards and checking out the dresses and jewelry on display. “You do business with people you know, and this allows business owners to get to know each other,” said Rick Childrey, the chamber’s president. Bud Andrews, now retired from First Citizens Bank, helped launch Business After Hours in the mid-1980s. He said many chamber members had trouble finding time to get together. Each month, the chamber picks a different host, giving all member businesses the chance to gain more exposure. Members also get to visit a variety of businesses. Last month, for example, they met at Springhill Outfitters, an outdoor sporting goods store. Next month, they’ll be at Barbour Court Nursing and Rehabilitation Center. “It gives businesses an opportunity to showcase their wares and tell everyone what they’re all about,” Andrews said. The business owners also talk about issues that could affect their bottom lines. A concern lately has been the Department of Transportation’s proposal to toll Interstate 95 to pay for much-needed improvements to the highway. 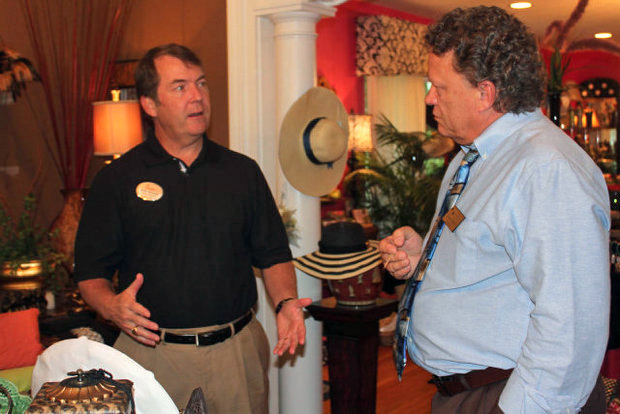 The chamber hopes to draw more local elected leaders to Business After Hours. Childrey wants to begin holding the monthly event on the days when the town council in Smithfield and Selma meet. Both towns allocate money to the chamber for economic development, so business and government in towns are closely allied. But business owners, who want to see central Johnston County grow, have some concerns they’d like to pass along to elected leaders. Keith Dimsdale, owner of Chick-Fil-A in Smithfield, said he’s interested in seeing how much the towns can work together to lower electricity rates. Smithfield and Selma are both public power towns, and their rates are considerably higher than those charged by Duke Progress Energy. The towns also have low property-tax rates, which can be an incentive, Dimsdale noted. “I think they kind of balance each other out,” he said. Dwight Morris of Johnston County Partnership for Children said reaching out to council members is important in reaching some of the chamber’s goals. Morris serves on the chamber’s appearance committee, which has raised money to beautify stretches of Market Street in Smithfield and the Exit 97 interchange in Selma.